Let’s ring up some family fun time! One way to build family relationships is to always have a plan for fun activities during family time. When I worked in behavioral health, I heard a lot of complaints of “I’m bored,” or “There is nothing to do.” They were families reaching out for help on how to build better relationships, learn positive coping skills and communication skills. 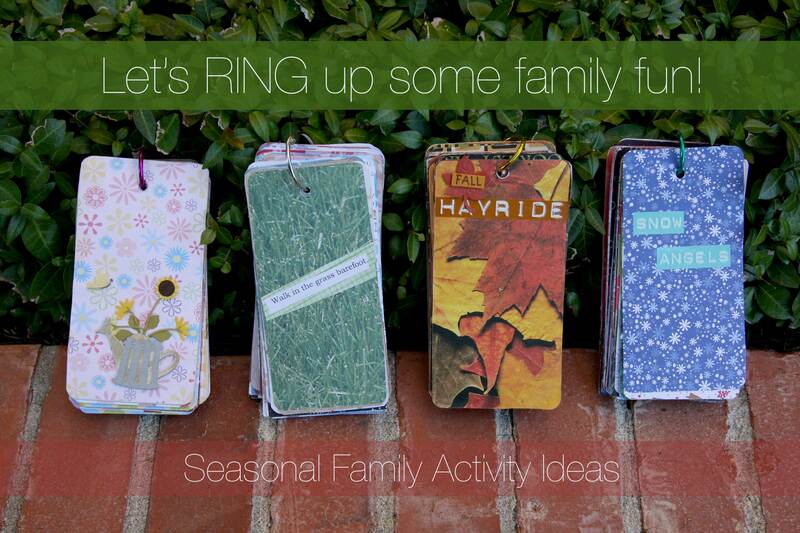 So, I came up with my seasonal family activities ideas on a binder ring. The photo above is an example of the ideas I made for my family using left over seasonal paper and stickers from my scrapbook stash. I divided my family activities by season because there are certain things you cannot do at different times of the year. It also helps with focusing and not to be side tracked by ideas you couldn’t possibly do (i.e. go trick or treating in April). Have a brainstorming session with your family. Set out the paper and art supplies. Let creativity and imagination take over. The ideas do not have to be expensive! You may be surprised at what your family likes to do! Write it all down. Draw art for the idea. Use stickers to illustrate the activity. The sky really is the limit on this project. It does not have to be perfect, only perfect for your family. You could also start new family traditions and add to your binder ring. You can throw away an idea that really didn’t work. This is the beauty of the binder ring. Plus, if you have a growing family…there will be new activities to do!